Computers have, no doubt, become an indispensable part of our daily routine. Whether you are a computer professional or someone who is hooked to services like Facebook and Twitter, spending hours sitting in front of computers has kind of become a new normal, despite the fact that it negatively affects our health – be it our body posture or eyes. It doesn’t matter if you use computers as part of your work or just for social/entertainment purposes, your health comes first, and you have to make sure that you follow a routine that minimizes the health risks that digital life has brought. While it obviously depends on an individual what steps they take to keep themselves healthy, there are also some applications that are designed to help you stay fit. 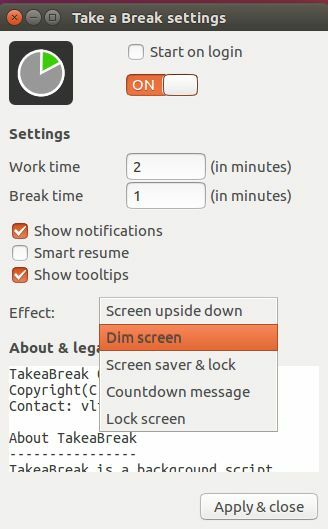 In this article we will discuss one such application called “Take a Break.” As the name suggests the application helps you take regular breaks from your computer-related work, something which is medically recommended. Please note that all the instructions as well as commands mentioned in this article have been tested on Ubuntu 16.04 LTS. 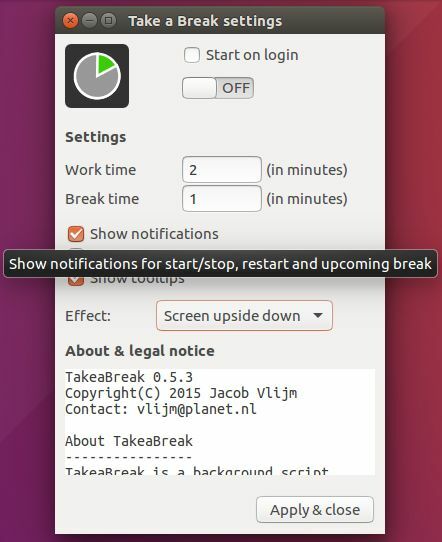 As already mentioned in the introduction above, Take a Break helps you take periodic breaks in Ubuntu so that you don’t spend too much time on your computer in one go, something which not only relaxes your eyes and brain but also makes sure that you do some bodily movements. The way the app works is it divides time into two parts: up time and break time. The former represents the time period for which you allow yourself to work at a stretch while the latter is the period for which the app asks you take a break. So, after the up time has passed, the app switches your computer to another state (such as screen upside down, dimmed, or screen saver). Interestingly, the application has its roots in a question on Askubuntu – you can take a look at the whole thread dicussing this here. Once the above-mentioned commands are successful, you can launch the application from Unity Dash. 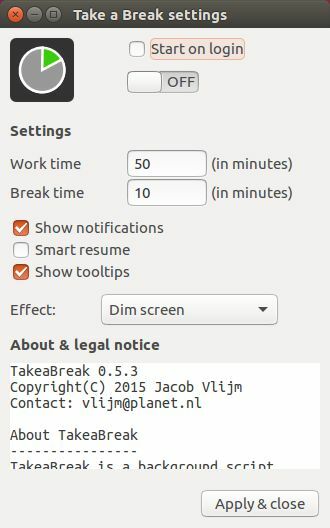 In the “Settings” section the “Work time” and “Break time” fields represent the “up time” and “break time” we discussed in the beginning of the article. By default, the values of these fields are 50 minutes and 10 minutes, respectively. This means that “Take a Break” will force you to take a ten-minute break after every fifty minutes of work. You can, of course, change these values to your own choices. Finally, the “Smart resume” option makes the tool start counting work time only from the moment the user actually starts working (when either keyboard or mouse is being touched). 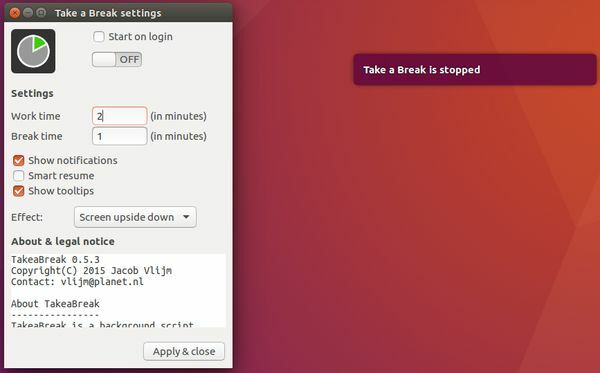 The “Start on login” checkbox at the top lets you configure whether or not you want to Take a Break to automatically run at system startup] while the on/off toggle below it starts/stops the tool. 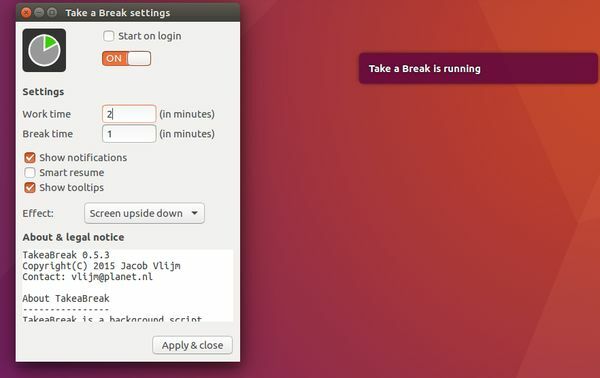 Take a Break offers several features to help you take periodic breaks in Ubuntu in the way that’s most convenient to you. Of course, applications like these aren’t magical wands – they can only help if health is your priority. If you’re serious about your health and think that Take a Break can help you better your digital routine, go ahead and start using it. Anything similar to this for Windows that you can recommend?